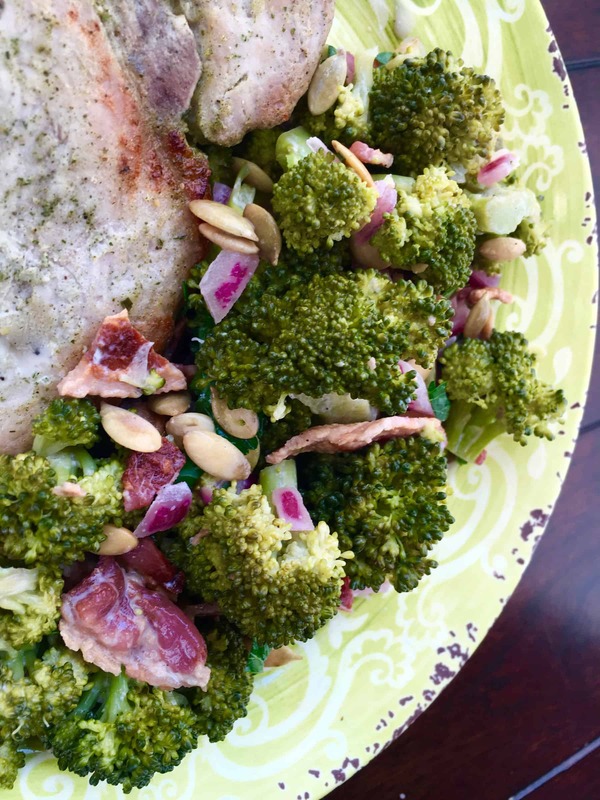 This keto side dish is perfect for picnics, potlucks and quick weeknight meals. 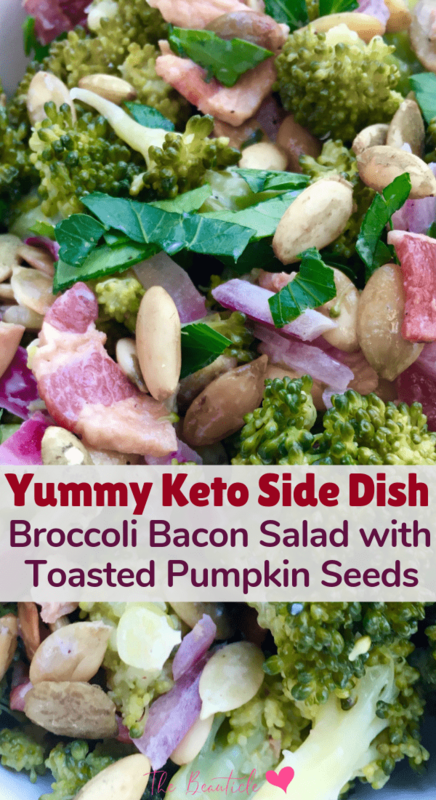 Our keto broccoli bacon salad is a mayonnaise-free dish that is light in flavor, calories and carbs but heavy on nutrition and made delicious with bacon! For best results, make it ahead or even the night before to give all the flavors time to blend together perfectly. This makes is a great keto meal-prep meal. Quick dishes like these make staying on the keto diet and getting into ketosis easier so that you can lose weight and control your health with ease. Try this as a side dish to our delicious Keto Pulled Pork or Keto Lemon Pepper Wings. 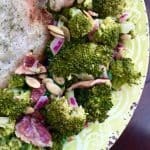 A light and flavorful keto side dish that is meal-preppable and perfect for parties. To make the dressing, combine the Greek yogurt, honey, lemon juice, and zest in a small bowl. Season with salt and pepper, to taste. Set aside. Add the broccoli florets to a large, microwave-safe dish and add 2-3 T. water. Cover and microwave on high for 4-5 minutes, or until florets are crisp tender. (Check after 3 minutes and adjust cooking times accordingly). Remove from microwave and drain excess liquid. Set aside, uncovered, and allow steamed florets to cool. 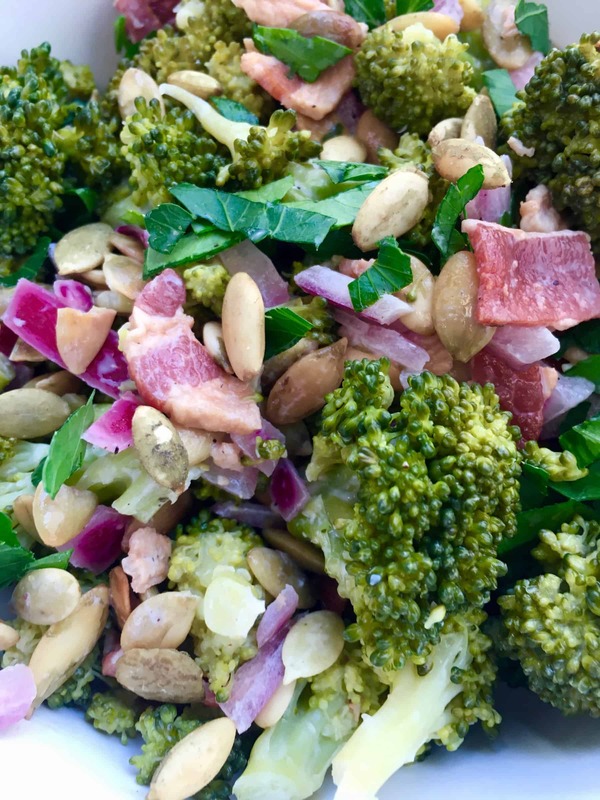 In a large glass or other non-reactive bowl, combine the red onion, broccoli, crumbled bacon, and fresh parsley. Toss gently to combine. Top with ½ Greek yogurt dressing and toss again until ingredients are thoroughly coated. Cover and refrigerate 30 minutes or overnight before serving. Cover and reserve remaining dressing, as well. Toss chilled salad with remaining dressing right before serving, or serve on the side for those who prefer a little extra dressing. Sprinkle with the toasted pumpkin seeds right before serving to keep them crunchy. *1 tablespoon of honey contains up to 17 grams of carbs, or approximately 4¼ grams per serving of salad. If this is too high for your needs, you can use a very small amount of stevia powder or liquid as a substitute.